Symphytum is a genus of flowering plants in the borage family, Boraginaceae. There are up to 35 species, known by the common name comfrey (pronounced /ˈkʌmfri/). Some species and hybrids, particularly S. officinale and S. × uplandicum, are used in gardening and herbal medicine. They are not to be confused with Cynoglossum virginianum, known as wild comfrey, another member of the borage family. The Russian comfrey 'Bocking 14' cultivar was developed during the 1950s by Lawrence D Hills, the founder of the Henry Doubleday Research Association (the organic gardening organisation itself named after the Quaker pioneer who first introduced Russian comfrey into Britain in the nineteenth century) following trials at Bocking, near Braintree. Comfrey is a source of fertilizer to the organic gardener. Many references can be found on organic gardening sites and in monthly gardening magazines.[who?] that since it is very deep rooted it acts as a dynamic accumulator, mining a host of nutrients from the soil. In fact there is little scientific evidence that the nutrients in comfrey are more concentrated than in other plants, nor that the nutrients it has come from its deep roots rather than, as is the case in most plants, from its near-surface roots. The nutrients that are available in comfrey are made available through its fast-growing leaves (up to 1.8–2.3 kilograms (4.0–5.1 lb) per plant per cut) which, lacking fibres, quickly break down to a thick black liquid. There is also no risk of nitrogen loss when comfrey is dug into the soil as the C:N ratio of the leaves is lower than that of well-rotted compost. Comfrey is an excellent source of potassium, an essential plant nutrient needed for flower, seed and fruit production. Its leaves contain 2–3 times more potassium than farmyard manure, mined from deep in the subsoil, tapping into reserves that would not normally be available to plants. Bocking 14 is sterile, and therefore will not set seed (one of its advantages over other cultivars as it will not spread out of control), thus is propagated from root cuttings. The gardener can produce his or her own "offsets" from mature, strongly growing plants by driving a spade horizontally through the leaf clumps about 7 cm (2.8 in) below the soil surface. This removes the crown, which can then be split into pieces. The original plant will quickly recover, and each piece can be replanted with the growing points just below the soil surface, and will quickly grow into new plants. When choosing plants to divide, ensure that they are strong healthy specimens with no signs of rust or mildew. When dividing comfrey plants, take care not to spread root fragments around, or dispose of on the compost heap, as each can re-root, and comfrey can be stubborn. Offsets can also be purchased by mail order from specialist nurseries in order to initially build up a stock of plants. 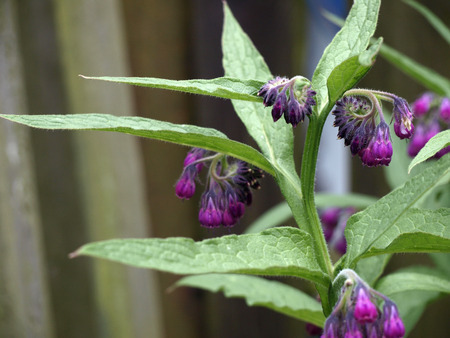 Folk medicine names for comfrey include knitbone, boneset and the derivation of its Latin name Symphytum (from the Greek symphis, meaning growing together of bones, and phyton, a plant), referring to its ancient uses. Similarly the common French name is consoude, meaning to weld together. The tradition in different cultures and languages suggest a common belief in its usefulness for mending bones. Comfrey contains mixed phytochemicals in varying amounts, including allantoin, mucilage, saponins, tannins, pyrrolizidine alkaloids, inulin, and proteins, among others. Liver toxicity is associated with consuming this plant or its extracts. In modern herbalism, comfrey is most commonly used topically. In 2001, the United States Food and Drug Administration issued a ban of comfrey products marketed for internal use, and a warning label for those intended for external use. Comfrey should not be used during pregnancy and lactation, in infants, and in people with liver, kidney, or vascular diseases.